The reference book about the reference implementation of EIPs. A journey through the framework for beginners and intermediate users. You overcome the book Enterprise Integration Patterns (EIP)? Great! Now, you need a framework to help you implementing the patterns. Enter Spring Integration. Compared to its most serious competitor, Apache Camel, Spring Integration respects perfectly the EIP book. The notation and naming are preserved and you do not need to learn anything else, except Spring Integration. 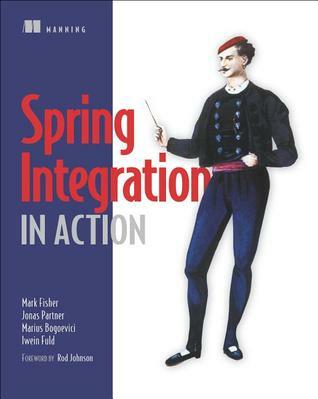 Written by the creator and core contributors, Spring Integration in Action is the best resource to keep at your desk. The book provides a high level overview of the framework, what clearly lacks the book Pro Spring Integration (Apress) and provide a lot more information than the Just Spring Integration of O’Reilly. This last book is an attractive alternative with just 100 pages but a framework like this one deserves a lot more to truly grasp its potential. Spring Integration in Action is a solid introduction on the topic of messaging. The authors introduce each patterns before explaining its implementation with Spring Integration. The book is well-organized, well-written and the coverage very broad. So, the question is : is the EIP book still a required reading? The answer is probably no to make your first steps with the framework but as soon as the flow of messages begins to grow, the EIP will be invaluable to learn the limitations and the variants of each patterns. If you are a developer or architect, with a basic knowledge of Spring (XML configuration) and no prior experience with Spring Integration, this book will teach you everything you need to add successfully on your project this really good module of the portfolio Spring. If the EIPs are not new to you, the official documentation is enough as Spring Integration follows to the letter the classic of Hohpe et Woolf.